Who knew learning about forces and mechanics outside could be so much fun? Peel Hall’s Headteacher, Gaynor Dunkley, wanted to find an inspiring way to take science outside the classroom. She met with our outdoor learning consultant, Michael Bischof, to discuss ideas and help bring her vision to life. After discussions, it was clear that Gaynor wanted to give her children areas to investigate plants, wildlife and nature but also, an interesting and unique outdoor scientific experiment. Our experiment had to get children engaged and enthusiastic about scientific topics and after much careful thought, we designed Peel Hall’s very own, ‘Lift a Child’ Pulley’s Experiment. The idea focuses on the topic of mechanisms and why their input of a motion/force differs from their output of a motion/force. We designed a Pulley System connected to a swing to demonstrate the lifting power of a pulley mechanism. As a child sits on the swing, the children must see how many of them it takes to pull the rope and lift the child higher. The Pulley’s can either demonstrate a 1:1 ratio of effort which is much harder to lift or a 1:4 ratio which makes lifting the child much easier. The design includes giant rulers to demonstrate the ratio of effort when lifting the child. Will the children be able to figure out why lifting the same child takes more effort through an adjusted Pulley System? This innovative and bespoke design can be used for numerous outdoor science lessons and can even introduce children to topics they'll come across in higher education in regards to forces, mechanical advantage and velocity ratio. Raised Dipping Pond – create a harmonious environment for aquatic insects, small fish and water-based plants. Bug Hotel – a home for mini-beasts! Children will be able to fill each tray compartments with bark, twigs, stones and grass to help attract insects to stay in your accommodation. Three Raised Planters – children will be able to grow and learn about plants including topics such as the plant life cycle. Bird Feeding Station – Birds are a wonderful species that fascinate children. Adding food to the feeding station will attract different types of birds for children to look at up close and personal. Walk in Storage Unit with Nature Identification Board – This high quality lockable timber unit will help store a high number of items. Children will be able use the identification board to learn more about the insects that they will be attracting to the area. 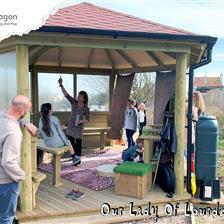 Picnic Table with Composter and Veggies Top – children will be able to learn about the natural world and important facts on plants and wildlife whilst sat socialising on the picnic bench. Recycled Composter – Children can turn food and garden waste into fresh compost. The spinning action ensures the material composts evenly. Are you looking for a fun and imaginative way to bring science outdoors? 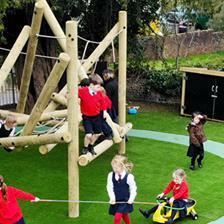 We have a wonderful range of Natural Play Equipment that will help bring science to life, we can even create something bespoke like we did for Peel Hall School in this case study. Simply Contact Us for more details and a free consultation. 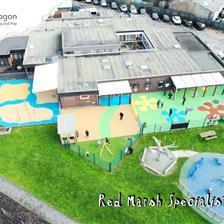 You can learn more about our Wildlife Area here, remember, we can bespoke design these to suit your exact needs.